Williams, M.K., Foulger, T.S. & Wetzel, K. (2009). Preparing Preservice Teachers for 21st Century Classrooms: Transforming Attitudes and Behaviors About Innovative Technology. 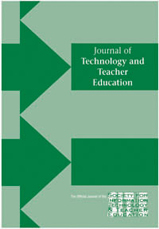 Journal of Technology and Teacher Education, 17 (3), 393-418. Waynesville, NC USA: Society for Information Technology & Teacher Education. Retrieved April 22, 2019 from https://www.learntechlib.org/primary/p/28216/.